PLEASE READ THESE TERMS AND CONDITIONS OF USE CAREFULLY BEFORE RENTING OR USING A BICYCLE (“BIKE”) FROM CYCLEHOP, LLC, CYCLEHOP WEST SIDE, LLC, OR ANY OF THEIR AFFILIATES (COLLECTIVELY, “CYCLEHOP”) AND THE REGENTS OF THE UNIVERSITY OF CALIFORNIA, ON BEHALF OF ITS LOS ANGELES CAMPUS (“UCLA”), THE UCLA DEPARTMENT OF TRANSPORTATION SERVICES, AS OWNERS OF THE UCLA BIKE SHARE SYSTEM. CYCLEHOP, UCLA AND THE UCLA DEPARTMENT OF TRANSPORTATION SERVICES ARE JOINTLY REFERENCED HEREIN AS THE “OPERATOR”. BY RENTING OR USING A BIKE, YOU AGREE TO ALL OF THE TERMS AND CONDITIONS CONTAINED HEREIN, INCLUDING, BUT NOT LIMITED TO, THE WAIVERS, RELEASES AND LIMITATIONS OF LIABILITY SET FORTH HEREIN. IF YOU DO NOT AGREE WITH ALL OF THE TERMS AND CONDITIONS OF USE, YOU ARE NOT PERMITTED TO RENT OR USE A BIKE FROM OPERATOR OR ITS AFFILIATES. (1) Purchase a membership online at bruinbikeshare.com, from a self-service kiosk located at a hub station, or from the Social Bicycles smart phone app. (2) Once Rider purchases a membership, Rider can access a bicycle in one of the following ways: sign into your account at bruinbikeshare.com and reserve a bicycle for up to ten (10) minutes, or use the Social Bicycles app to locate an available bike and reserve the bicycle for up to ten (10) minutes, or by walking up to a bike and entering your account number and PIN using the keypad on-board the bicycle located on the bicycle rear rack. Please note that when using the reservation feature you will only have ten (10) minutes from the time you reserved the bicycle to the time you unlock the bicycle. (3) The Lock should be holstered properly on the rear rack during Bike use, and used to lock the Bike whenever the Bike is not in use, including at locations other than a Rack at a designated station. Rider’s period of Bike rental begins either when the Bike is unlocked or at the time the Rider reserves a Bike with the mobile app or on the website. The Rental Period ends when the Bike is locked at a designated hub location or at any other public bike rack using the gray Lock bar. (“Rental Period”). Rider must wait for verification, on the Bike screen, indicating the Rental Period has ended. Additional fees will apply if the Bike is not returned and locked to a designated station. Rental Periods will be rounded up and then prorated to the next highest minute. 1.4. BOUNDARIES. Bikes may not be left outside of the boundaries posted at each Station (“Program Area”), shown on the mobile app, and visible on the program website www.bruinbikeshare.com. Locking the bike constitutes expiration of the Rental Period and a $20.00 fee will be charged to Rider’s account each time the Bike is locked outside the Program Area boundaries. 2.1. RENTAL PLANS. You may purchase from Operator Pay As You Go plans or monthly rental plans. The Pay As You Go plan requires a minimum purchase of $7.00 to activate an account, minutes are purchased in advance and the balance of available time is reduced when used. Unused minutes do not expire. Rider is charged by the minute from the time the Bike is unlocked to the time the Bike is locked. Monthly member plans entitle Rider to a fixed amount of “Daily Riding Time” defined as the number of minutes included with your plan each day, or as Bike use per day. The Basic plan includes 90 minutes of Bike use per calendar day, which may be used in one trip or in multiple trips. There will be no rollover credit. Riding minutes in excess of plan minutes will be rounded to the next highest minute and prorated at the Pay As You Go rate. • Monthly plans are recurring and Rider will be charged every 30 days until the membership is canceled by Rider. Annual plans are recurring and Rider will be charged yearly until the membership is canceled by Rider. 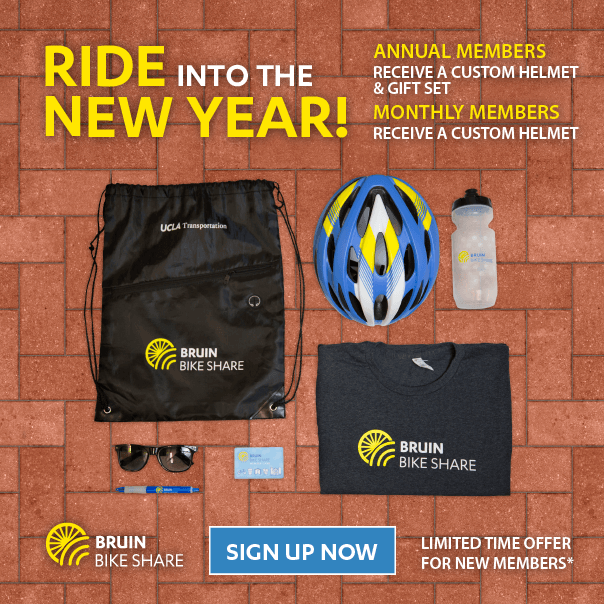 To cancel your membership, login to your account at bruinbikeshare.com. 2.2. OVERAGE FEES. Riders with membership plans shall be responsible to pay any additional time beyond the time to which they are entitled in their chosen plan on any given day. Rider agrees to pay Operator for any additional time beyond the allocated use time at a rate of $7.00 per additional hour prorated by the minute. 2.3. MAXIMUM RENTAL TIME. If a Bike is not returned to a designated Hub within 12 hours of the start of Rider’s Rental Period, Operator may deem the Bike to be stolen and charge Rider the amount of $2,000.00. 2.4. FEE FOR NOT RETURNING (OR RETURNING) A BIKE TO A BRUIN BIKE SHARE HUB. Each time a Rider does not return a Bike to a designated Hub the Operator may charge Rider $2.00. Each time Rider begins his or her Rental Period with a Bike that is not in a Bruin Bike Share Hub, but returns that Bike to a Bruin Bike Share Hub, the Rider shall receive a $1.00 credit to Rider’s account. 2.5. OUT OF PROGRAM AREA FEE. Operator may charge Rider $20.00 for each time Rider locks a Bike outside of the defined Program Area. 2.7. STOLEN BIKE FEE. If Rider leaves a Bike unlocked or unattended and it is stolen, Operator may charge Rider a replacement cost equal to $2,000.00. 2.8. VIOLATIONS. Rider shall be completely responsible, and shall indemnify Operator, for any tickets or fees assessed against the Bike or Operator during Rider’s Rental Period or as a result of the location where Rider parked the Bike. Rider is responsible for all tickets and moving violations incurred during the Rental Period. Rider agrees to reimburse Operator for any costs, expenses and/or attorney’s fees for processing, pursuing and/or defending any such claims. 2.9. CREDIT CARD OR DEBIT CARD. Rider must provide Operator a valid credit or debit card number and expiration date before being registered to use a Bike. Rider represents and warrants to Operator that Rider is authorized to use the credit or debit card information provided. Rider authorizes Operator to charge the credit or debit card for which information is provided for all fees incurred by Rider under this Agreement, and all fees are subject to applicable sales taxes and other local government charges, which may be charged and collected by Operator. In the event Rider’s payment method on file with Operator is declined for any reason, Operator may suspend Rider’s rental plan and ability to use any Bikes until all of Rider’s prior charges are paid in full and charge Rider a $5.00 reinstatement fee. 2.10. RENTAL OF MULTIPLE BICYCLES. Subject to program requirements and availability, a Rider who purchases a membership may rent up to 6 [six] Bikes at the same time on one account. If a Rider elects to rent multiple Bikes at the same time, Rider agrees to rent the first Bike for Rider’s own use and to make subsequent Bikes available to additional riders. If a Rider elects to rent multiple bikes, the first bike will utilize the Rider’s subscription minutes and additional bikes will be billed to the Rider’s account at the Pay As You Go rate of $7 per hour. Prior to riding, the additional rider renting a Bike under Rider’s account will need to review and accept this Agreement on the Bike’s keypad. Rider further acknowledges and agrees that (a) Rider shall be responsible for each Bike rented under Rider’s account, (b) Rider shall be responsible for ensuring that any individual operating or using a Bike rented under Rider’s account shall read and comply with this Agreement, and (c) Rider is fully and completely responsible and liable for all Claims (as defined in Section 5, below) arising from or related to another individual’s use of a Bike rented under Rider’s account. • Riders under the age of 18 are required to wear a helmet pursuant to California Vehicle Code § 21212(a). • If Rider causes damage to property or injury to another party while operating or in possession of the Bike, Rider is solely liable for such damage or injury. Rider agrees to defend and hold harmless Operator from any and all losses, liabilities, claims, causes of action, costs, fees, , penalties or the like arising from Rider’s use or possession of the Bike. • Use any Bike if Rider is not physically and mentally fit to ride the Bike. 5.1. FOR AND IN CONSIDERATION OF RENTAL AND USE OF THE BIKE AND TO THE FULLEST EXTENT PERMITTED BY LAW, RIDER, FOR HIMSELF OR HERSELF AND ON BEHALF OF RIDER’S HEIRS, EXECUTORS, ADMINISTRATORS AND ASSIGNS, FOREVER RELEASES AND RELINQUISHES AND DISCHARGES (i) OPERATOR AND OPERATOR’S OFFICERS, BOARDS AND COMMISSIONS, MEMBERS, MANAGERS, EMPLOYEES, SUPPLIERS, AGENTS, REPRESENTATIVES, (ii) ANY MUNICIPALITY WITH WHICH OPERATOR HAS CONTRACTED WITH TO PROVIDE A BIKE SHARE PROGRAM, AND (iii) ANY OWNER OF PROPERTY WITH WHICH THE UNIVERSITY OF CALIFORNIA, THE UCLA DEPARTMENT OF TRANSPORTATION SERVICES OR CYCLEHOP HAS CONTRACTED WITH TO PROVIDE REAL PROPERTY ON WHICH A BIKE SHARE FACILITY, INCLUDING, WITHOUT LIMITATION, STATIONS, HUBS, RACKS, INTENDED FOR BIKE SHARE USE (ALL, COLLECTIVELY, THE “OPERATOR PARTIES”) FROM ANY AND ALL CLAIMS, DEMANDS, DISPUTES, LOSSES, LIABILITIES, DEBTS, LIENS, CHARGES, PENALTIES, PROCEEDINGS, CAUSES OF ACTION AND DAMAGES INCLUDING BUT NOT LIMITED TO, FOR PERSONAL INJURY, WRONGFUL DEATH, PROPERTY DAMAGE, AND INJURY TO RIDER OR TO THIRD PARTIES (COLLECTIVELY, “CLAIMS”), INCLUDING UNKNOWN OR UNANTICIPATED CLAIMS, WHICH ARISE FROM OR ARE RELATED DIRECTLY OR INDIRECTLY TO: (A) THIS AGREEMENT OR THE RENTAL, MAINTENANCE, DESIGN, USE AND/OR OPERATION OF THE OPERATOR EQUIPMENT, INCLUDING THE BIKES, OR THE OPERATOR WEBSITE; (B) ANY RISK, DANGER OR HAZARD DESCRIBED IN THIS AGREEMENT; (C) RIDER’S USE OF, OR INABILITY TO USE, ANY OF THE OPERATOR EQUIPMENT; (D) RIDER’S BREACH OF THIS AGREEMENT OR RIDER’S VIOLATION OF ANY LAW; (E) ANY NEGLIGENE, MISCONDUCT, OR OTHER ACTION OR INACTION BY RIDER OR A THIRD PARTY; OR (F) RIDER’S FAILURE TO WEAR PROTECTIVE GEAR SUCH AS A HELMET WHILE UTILIZING THE OPERATOR EQUIPMENT. TO THE FULLEST EXTENT PERMITTED BY LAW, THIS RELEASE AND HOLD HARMLESS AGREEMENT INCLUDES ANY AND ALL CLAIMS RELATED TO OR ARISING FROM THE SOLE OR PARTIAL NEGLIGENCE OF OPERATOR, THE OPERATOR PARTIES OR ANY OTHER PARTY. RIDER HEREBY EXPRESSLY WAIVES ANY CLAIMS AGAINST THE OPERATOR PARTIES WHICH RIDER DOES NOT KNOW OR SUSPECT TO EXIST IN HIS OR HER FAVOR AT THE TIME OF RENTING A BIKE, AND EXPRESSLY WAIVES RIDER’S RIGHTS UNDER ANY STATUTES THAT PURPORT TO PRESERVE RIDER’S UNKNOWN CLAIMS. 5.3 ASSUMPTIONS OF RISKS; DISCLAIMER. RIDER AGREES THAT BICYCLES ARE MACHINES THAT MAY MALFUNCTION, EVEN IF THE BIKE IS PROPERLY MAINTAINED, AND THAT SUCH MALFUNCTION MAY CAUSE INJURY. RIDER EXPRESSLY ACKNOWLEDGES AND ACCEPTS THAT RIDER’S RENTAL AND USE OF THE BIKE IS AT HIS/HER OWN RISK, AND THAT BY CHOOSING TO RIDE A BIKE, RIDER ASSUMES FULL AND COMPLETE RESPONSIBILITY FOR ALL RELATED RISKS, DANGERS, AND HAZARDS. RIDER ACCEPTS THE BIKE FOR USE AFTER EXERCISING HIS/HER OWN FREE CHOICE TO PARTICIPATE VOLUNTARILY IN THIS ACTIVITY AND AFTER HAVING INSPECTED THE BIKE AND CERTIFYING THAT IS IN GOOD OPERATING CONDITION. RIDER UNDERSTANDS THAT BICYCLING MAY BE A HAZARDOUS ACTIVITY THAT INVOLVES MANY OBVIOUS AND NOT-SO-OBVIOUS RISKS, DANGERS, AND HAZARDS, WHICH MAY RESULT IN INJURY OR DEATH TO RIDER OR OTHERS, AS WELL AS DAMAGE TO PROPERTY, AND THAT SUCH RISKS, DANGERS, AND HAZARDS CANNOT ALWAYS BE PREDICTED OR AVOIDED. RIDER ACKNOWLEDGES, UNDERSTANDS AND ASSUMES ALL RISK RELATING TO THE RENTAL, MAINTENANCE, DESIGN, USE AND/OR OPERATION OF THE OPERATOR EQUIPMENT, INCLUDING THE BIKES, AND THE OPERATOR WEBSITE AND UNDERSTANDS THAT BICYCLING INVOLVES RISK TO THE RIDER AND OTHERS INCLUDING DAMAGES, BODILY INJURY, PARTIAL OR TOTAL DISABILITY, PARALYSIS AND DEATH TO RIDER OR OTHERS, AND THAT RIDER HAS FULL KNOWLEDGE OF SAID RISKS AND DANGERS, INCLUDING SUCH RISKS, DAMAGES AND INJURIES THAT MAY ARISE FROM THE NEGLIGENCE OF OTHERS OR AS A RESULT OF ROADWAY CONDITIONS. ALL BIKES AND OTHER OPERATOR EQUIPMENT ARE PROVIDED “AS IS” AND WITHOUT ANY WARRANTY OF ANY KIND, WHETHER EXPRESS OR IMPLIED, WRITTEN OR ORAL, INCLUDING, WITHOUT LIMITATION, ANY WARRANTY OF MERCHANTABILITY, QUALITY OR FITNESS FOR A PARTICULAR PURPOSE. OPERATOR AND THE OPERATOR PARTIES HEREBY DISCLAIM ANY CLAIM IN TORT (INCLUDING NEGLIGENCE, PRODUCT LIABILITY OR STRICT LIABILITY). IN NO EVENT WILL RIDER CLAIM THAT OPERATOR PARTIES INDIVIDUALLY OR COLLECTIVELY FAILED TO ADEQUATELY TRAIN RIDER, OR PROVIDE RIDER WITH ADEQUATE INSTRUCTIONS NECESSARY TO RIDE THE BIKE IN THE SAME MANNER AS A PERSON WHO IS AN EXPERIENCED BIKE RIDER WHO HAS BEEN TRAINED TO RIDE A BIKE IN A SAFE AND CAREFUL MANNER. TO THE FULLEST EXTENT PERMITTED BY LAW, AND WITH RESPECT TO RIDER’S RENTAL AND USE OF THE BIKE, STATIONS, OR RELATED INFORMATION, OPERATOR PARTIES DISCLAIMS ALL EXPRESS AND IMPLIED WARRANTIES, INCLUDING WARRANTIES OF MERCHANTABILITY AND FITNESS FOR A PARTICULAR PURPOSE. OPERATOR PARTIES DO NOT REPRESENT OR WARRANT THAT ANY OF THE BIKES, OPERATOR EQUIPMENT OR RELATED INFORMATION WILL BE IN GOOD REPAIR OR ERROR-FREE, AND DELAYS, OMISSIONS, INTERRUPTIONS, OR INACCURACIES COULD EXIST WITH RESPECT TO ANY OF THE BIKES, OPERATOR EQUIPMENT OR RELATED INFORMATION. RIDER ASSUMES FULL RESPONSIBILITY AND RISK OF LOSS FOR USING ANY OF THE BIKES, OPERATOR EQUIPMENT OR RELATED INFORMATION, AND THE OPERATOR PARTIES ARE NOT LIABLE FOR ANY CLAIM ATTRIBUTABLE TO ANY OF THE FOREGOING. RIDER ASSUMES FULL AND COMPLETE RESPONSIBILITY AND LIABILITY FOR ALL CONSEQUENCES AND CLAIMS OF ANY KIND OR NATURE WHATSOEVER RELATED TO RIDER’S STOLEN OR LOST BIKE. This Agreement constitutes the final and entire Agreement between Operator and Rider and prevails over any prior or contemporaneous, conflicting or additional, communications, unless otherwise agreed to by the Parties in writing. Operator shall have the right to revise, change and modify the terms and conditions contained in this Agreement at any time without prior written notification by posting the revised Agreement on www.bruinbikeshare.com, and such changes shall apply to all future use of Bikes after the date of such changes. Riders shall be solely responsible for reviewing and becoming familiar with any modification to this Agreement. Use and/or operation of the Bike by Rider following any modifications to this Agreement constitutes Rider’s acceptance of the terms and conditions as modified.